BDN: Can you tell us a little bit about your high school career and your strengths on the field? Well, I only started playing offensive line at the end of my sophomore year. I went to a bunch of camps, and this past year I made the All-County Team and the 2nd Team All-State. Some of my strengths are just my footwork and my aggression. BDN: You mentioned that you’ve been able to attend a few camps this year; what are some of the things you’re working on as you head into your senior season? Just my strength and my pad level. BDN: I know you have a pretty long offer list, so I won’t ask you to name all of the schools that are interested in you, but where do you currently stand with scholarship offers? I have about 20 scholarship offers right now. And some of the bigger ones are Michigan State, Duke, USF, Wake Forest, Illinois, Kentucky, Vanderbilt, UCF, and a couple other ones. BDN: That’s an impressive total. Where would you say you are in your recruiting process right now? Right now I’m looking to narrow it down. I’m going to visit Michigan State and Illinois and then I’ll have like a top 5 probably after I make that trip. BDN: Obviously, it will be tough to narrow things down to five schools, but what are the most important things that you are looking for as you evaluate a program? Just the school’s atmosphere, the coaching staff, and the way I feel when I’m around them and around the other players that are playing there currently. BDN: Which schools have you had a chance to visit so far and have any stood out to you? I’ve visited Wake Forest, Duke, Vanderbilt, Georgia, LSU, Florida, Miami…I visited UCF, USF, and some of the schools that are standing out to me are USF, Wake Forest, Duke, just because of their coaching staffs and the total package of the school. BDN: You mentioned that you’d like to have a top 5 after these next couple of visits. What are your plans for narrowing things down and making a decision from there? Probably going to take like 2 or 3 official visits, but most likely the middle of my season is when I’m going to make my decision. BDN: Are there any schools that you think you definitely want to take an official visit to at this point? I’m still kind of narrowing all that down. BDN: Thanks a lot, Robert, and best of luck to you. 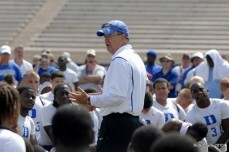 Head Coach David Cutcliffe added Tanner Stone to the Duke class of 2012 Wednesday. One of the areas of greatest improvement within the Duke football program since the arrival of Head Coach David Cutcliffe has been the offensive line. This fall, Duke is expected to feature one of the strongest and deepest groups in the Atlantic Coast Conference. Offensive Line Coach Matt Luke has worked hard to build the position group with Duke’s current players, while also working tirelessly on the recruiting trail. 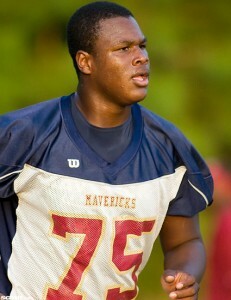 On Wednesday, his efforts resulted in the addition of another talented offensive lineman to the Duke program. Tanner Stone, a 6’6” 260 pound prospect from Highland Park HS in Dallas, Texas, has committed to the Blue Devils. As a junior, Stone helped lead the Scots to a 12-1 overall record and the Texas 4A state playoffs. Tanner spoke with BDN shortly after his decision today. BDN: What are your strengths as a player? I think they say I’m a good pass-blocker, I have good feet, and I’m quick enough to catch someone off the edge and I work hard and all that jazz. BDN: What are you working on this summer as you prepare for your senior year? I think the main thing is gaining weight, because I’m at about 250 right now and I know for a college offensive lineman, I need to be near the 300s. Yeah, I actually was up there last weekend for their football camps and met all the coaches, and all the coaches were really cool and they just have a really good program. They’re on the rise because all of their coaches are from really good schools and I think they’re going to do a lot for the program. Also, it’s just outstanding academic-wise and it’s overall just a good fit for me. BDN: Is there anything else you want Duke fans to know about you? I’m going to try my best to do whatever I can for the team and just try to win and work hard. 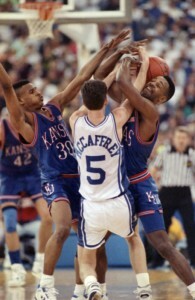 BDN: Thanks a lot, Tanner, and welcome to Duke. The Duke coaching staff has been scouting the country in search of players to help improve the Blue Devil defense, but they have been focused on an in-state linebacker for several months now. Keilin Rayner is a 6’3” 220 pound linebacker prospect from Leland, North Carolina. As a junior, Keilin played primarily defensive end, helping North Brunswick HS to the state playoffs and a 5-7 overall record. The Duke coaching staff would love to add Rayner to the class of 2012 at linebacker, where he could make an early impact for the Blue Devils. Highlights from Keilin's junior year can be viewed here. Duke and ECU were the first two programs to offer a scholarship to Rayner, whose recruitment has taken off this spring. When BDN last spoke with Keilin, Duke was a program that had impressed him, but with over half a dozen offers now, where do the Blue Devils stand? BDN: What coaches have stopped by to see you this spring? Pretty much all of them, Clemson, Maryland, Virginia Tech, [NC] State, [North] Carolina, ECU, and Wake Forest came by. BDN: When we last spoke Duke and ECU were the first two schools to offer you; what other schools have offered you this spring? [North] Carolina, [NC] State, Duke, ECU, Wake, Clemson, South Carolina, Florida International, I think that’s about it. BDN: Which schools have you visited so far? I didn’t get to visit any this spring, but previously I visited ECU, [NC] State, and Duke. I’m hoping to visit [North] Carolina maybe next week. BDN: Do you have plans for any other visits this summer? Maybe some camps, but other than that I don’t know yet. BDN: With recruiting picking up for you, what are your thoughts for when you want to narrow things down and make your decision? I would like to visit all the schools that have offered me and some other schools that haven’t, probably make my decision later after I’ve visited. BDN: Which schools or coaches do you feel like you have the best relationship with? Coach Cutcliffe and Coach Luke from Duke. BDN: What are your plans for the summer? Just work out, pretty much. BDN: That’s great, I know you mentioned you would be playing more linebacker this fall, what kind of things have you been working on? A lot of coaches said to work on my hip flexibility and getting off the ball, working on that. BDN: Thanks a lot, Keilin, and best of luck. You still haven’t joined BDN Premium? Man, you’re missing out! Surprisingly, those were the reviews for the movie Hop, not Football Friday, but I sure would have been honored. Oh well, I don’t let the critics read my column, anyway. We start on two down notes today, but we'll rally down the home stretch. 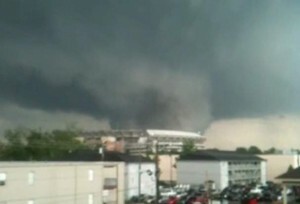 Tornadoes hit the South this week, including this massive twister just outside Bryant Denny Stadium in Tuscaloosa, AL. Our thoughts and prayers are with all of those affected by the strong storms and tornadoes that tore through the South on Wednesday, claiming nearly 300 lives. Neighborhoods and communities have been severely damaged and destroyed. It will take many months to piece back together the lives of the families affected, and there are many noble organizations that have quickly mobilized relief efforts. Please consider donating your time, money, goods, blood - whatever you can - to help those in need: American Red Cross, Salvation Army, Samaritan’s Purse, among many other deserving national and local groups. Head Coach David Cutcliffe, an Alabama native, will assist with a Time Warner Cable Recovery Drive today at 4 PM. There are only a select few who could honestly lay claim to the title "Duke Football's Greatest Fan," and Mrs. Caldwell would make the short list. The widow of former Duke Assistant Coach Herschel Caldwell, who came to Duke as an assistant one year before Wallace Wade, Mrs. Caldwell passed away this week on her 103rd birthday. A remarkable woman, Mrs. Caldwell missed only two Duke football home games in the past 77 years. In lieu of flowers, memorials may be made to The Good Samaritan Fund, c/o Duke Memorial United Methodist Church, 504 W. Chapel Hill Street, Durham, N.C., 27701 or to The Discretionary Fund, c/o Father Bert Eaton, St. Peters by the Sea, P.O. Box 337 Swansboro, N.C., 28584. Colorado WR Max McCaffrey, son of former NFL WR Ed McCaffrey and nephew of 1991 Duke National Champion Billy McCaffrey, was in Durham recently. In today’s recruiting, it’s a rarity for a prospect to commit to a school sight unseen. Thus, getting a prospect on campus for an unofficial visit, whether it’s for a game, a junior day, a summer camp or just a campus tour, is an important component of the recruiting process. In the world of emails, texting, and Facebook, there’s still no substitute for seeing coaches, players, and facilities in person. Even though spring practices are well behind us and the spring evaluation period is underway, three key prospects have been on campus over the past week. Max McCaffrey: the 6’2” 180 pound wide receiver prospect from Highlands Ranch, Colorado made the trip to Duke with his mother recently. The son of former NFL and Stanford WR Ed McCaffrey, Max is also the nephew of former Duke men’s basketball player Billy McCaffrey, who transferred to Vanderbilt after the 1991 National Championship. Max and his younger brother, Christian (a rising sophomore running back) will look to lead Valor Christian to their third state championship this fall. 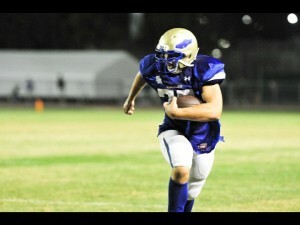 Max currently has scholarship offers from Duke, Wake Forest, and Arizona State. Eric Olson: Coach Luke would love to continue his success in recruiting talented offensive linemen, and Olson would certainly fit the bill. An athletic 6’6” 265 pound prospect from Cambridge, Massachusetts, Olson also played basketball briefly for Buckingham Browne & Nichols (per BDN’s Andrew Slater). Olson was on campus last weekend for an overnight visit, just a month after visiting for Duke’s spring game. Olson grew up a Duke basketball fan and the Blue Devils remain a major player in Olson’s recruitment, even though he is now up to 8 offers, including Boston College, Connecticut, Virginia, and Wake Forest, with interest from Northwestern and Stanford. Dan Beilinson: If it’s good to get a prospect on campus for a visit, then it has to be very good to get a prospect on campus frequently. There are a handful of North Carolina prospects who have been frequent visitors to Wallace Wade Stadium, and the 6’5” 220 pound tight end Beilinson is one of them. Out of nearby Panther Creek in Cary, Beilinson has focused his visits so far on the three Triangle schools, and has developed a close relationship with the Duke staff. With some added weight, Beilinson has the tools to be a complete tight end that could thrive alongside current 2012 commit Erich Schneider in the Blue Devils’ prolific passing offense. The talented athlete already has five scholarship offers, including Duke, NC State, and Vanderbilt, with interest from Auburn, Florida, North Carolina, and Wake Forest. 1. Coach Cutcliffe always speaks in hyperbole, creating unrealistic expectations. First of all, what college head coach doesn’t? It’s basically in the job description. In Coach Cutcliffe’s case, he inherited a program defined by its culture of losing. Before you can succeed, you have to believe you can succeed, and that mentality has to be embraced throughout the program – from the administration to the coaching staff to the players to the fans. There’s no question that Coach Cutcliffe has done a remarkable job of changing the culture at Duke, to the point that coaches, players, and fans expect Duke to win games. Perhaps the best indicator of this is the incoming recruiting class of 2011 – several players have told BDN that they’re coming to Duke not just for the education or the chance to play football, but they plan on winning an ACC Championship. As for this year’s squad, when asked about the Blue Devils’ 2011 bowl chances, Cutcliffe said, “I don’t think there’s any question we’re at that level. We don’t have a huge margin of error just yet, but not anybody does, for the most part.” With a potent, veteran offense and a young, athletic defense, that sounds like a pretty fair assessment. 2. Duke has not been recruiting 4- and 5-star talent. The correct criticism here is that Duke has not been bringing in 4- and 5-star talent, but it isn’t from a lack of effort. 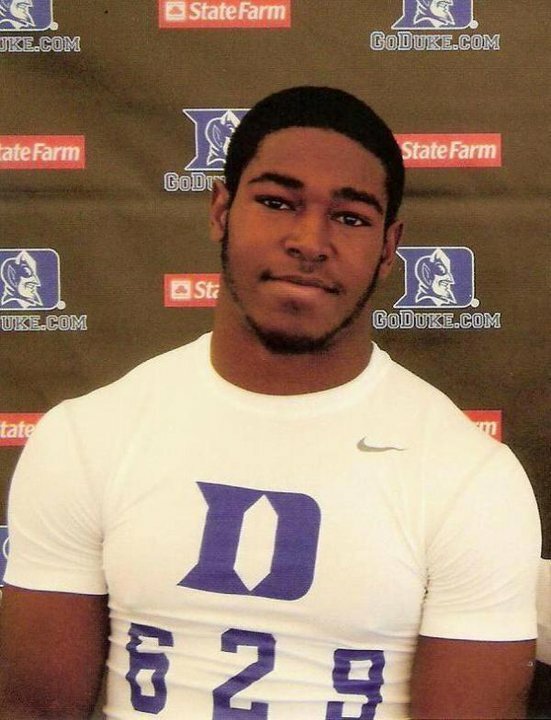 In the class of 2010, the Blue Devils offered at least 3 5-star prospects and 38 4-star prospects (and secured an initial commitment from LB Aramide Olaniyan). In 2011, Duke offered at least 4 5-star prospects and 51 4-star prospects (and nearly landed TE Cam Clear). While the class of 2012 rankings have yet to be released, Duke is going up against national powers for some of the top recruits and appears to be holding their own in at least a few cases so far. There’s no question that Duke needs to land some of these commits, and winning games will go a long way to helping that cause. 3. Duke has focused too much on regional recruiting. Those numbers indicate to me that Duke is recruiting where the talent is, but by all means, please check my math. 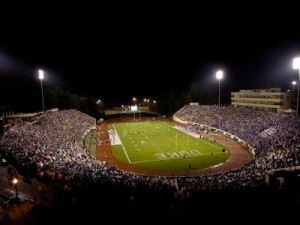 There's excitement back in Wallace Wade Stadium - it's time to get on board the Duke Football bandwagon. 4. It’s still the same old Duke. Bottom line, the talk of rebuilding our football program is getting tiresome to many fans, but progress is being made. The university has invested in the football program (check out our new indoor practice facility – sah-weet!) and fans are trickling back in to Wallace Wade Stadium, as season ticket sales have steadily increased. Even with a 3-win season in 2010, the Blue Devils have won more games under Coach Cutcliffe than they did in the previous 8 seasons (12 wins 2008-2010, 10 wins 2000-2007). No one is more tired of the talk than the players and coaches, who are ready to produce results on the field. Behind a strong offensive line, a solid stable of running backs, an All-ACC receiving corps, and arguably the best returning QB in the conference, this Blue Devil team has high hopes for the fall. There’s no question that the next step is to put together a winning season, and I can’t wait to find out if this Blue Devil team is tough enough to do it. Seems like a good note to end on. WE ARE DUKE. In their three-plus years in Durham, Head Coach David Cutcliffe and Offensive Line Coach Matt Luke have built the Duke offensive line into a position of strength. 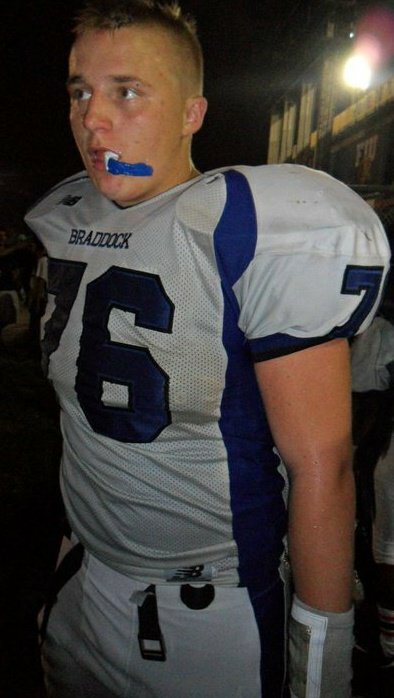 The past two recruiting classes have brought in a very good group of offensive linemen, and the Blue Devils hope to continue that trend with the class of 2012. Max Tuerk is a 6’6” 275 pound offensive lineman from Santa Margarita, California. Though he’s early in the recruiting process, the junior already holds offers from Duke, Washington, and SMU. Highlights from his junior year, which earned him 1st Team All State and Trinity Lineman of the Year honors, can be viewed here. My strengths as a player are I work really hard, I’m always trying to get better in the weight room and practice. Right now, I’ve been gaining a lot of weight and that was probably my biggest problem last year, I weighed like 250 only, and now I’m up to 275, and I’m pretty fast for an offensive lineman, so that’s probably my biggest strength. Gaining weight, and gaining strength, definitely. For the team I’ve love if we can win our division, we went to the playoffs last year and we lost in the second round. And I’m hoping that this year we can win CIF, and that’d be awesome for me. In a college, most important thing is probably just to get to know all the coaches, get to know some of the members that are gonna be in my team. Know the school, if it’s a good school, good academics. Good campus, just – kind of get to know everything about the school. Not yet. I have visited Washington 2 years ago, for like a football tournament, for passing tournament, I went as a tight end, and it was a cool campus, so that’s the only school I’ve visited. Yeah, I’m hoping I can go to Duke. I’m hoping to check out Washington and maybe SMU even, and I’m hoping to go to USC, check out USC, just the schools around my house kind of. Yeah, definitely. I’ve talked to Duke’s offensive line coach this week for a while, actually, and we’re steadily starting to get a relationship. I emailed a lot of the coaches, the coaches at SMU, and I talk to a lot of the coaches on almost a daily basis, and we’re definitely developing relationships. I’m a good kid and I work really hard, and I’m hoping to – I love football, and I’m just hoping it’ll take me to college. BDN: Thanks a lot, Max, and best of luck to you.